Greenhouses support our environment and eco-system due to its energy efficient design that gives the maximum light transmission during crop growth. The design and architecture allow sunlight in during the day, retaining as much heat as possible during cold weather, and providing sufficient ventilation to avoid excessive inner temperature and humidity. Increasing energy costs make conservation and efficient use of facilities an important part of today's greenhouse operation. The benefits of a greenhouse are huge such as it enhances the food production, consumes less water, less pesticide need, longer growing season and better working conditions. However, the biggest barrier to greenhouse adoption is cost, including the cost of installation and materials, and the on-going cost to cool, heat and light the greenhouses. Using solar panels to generate electricity dramatically lowers the cost of powering a greenhouse. Now with new solar energy technology developed at UC Santa Cruz, these problems are the talk of past. The greenhouses run on renewable solar energy utilize Wavelength-Selective Photovoltaic Systems (WSPVs), the solar technology that generates electricity more efficiently and at less cost than traditional photovoltaic systems. WSPV technology was developed by co-authors Sue Carter and Glenn Alers, both professors of physics at UC Santa Cruz, who founded Soliculture in 2012 to bring the technology to market. The colored solar panels are embedded in the roof is a bright magenta luminescent dye that absorbs blue and green wavelengths of light, and transfers its energy to narrow photovoltaic strips. It allows more power, productivity and profits for the growers. 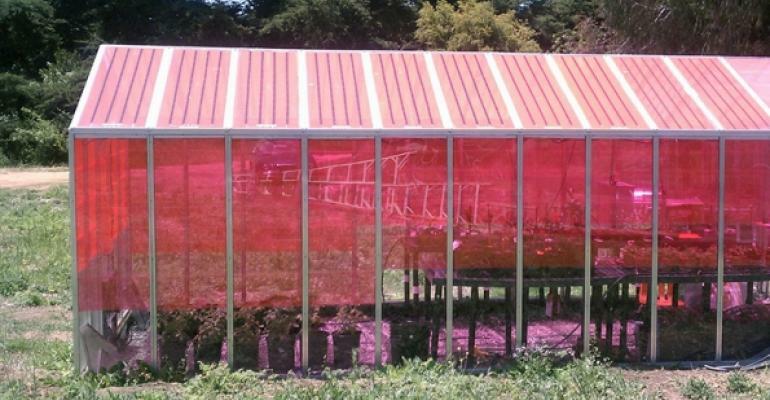 A study led by Soliculture co-founder Prof. Michael Loik, a variety of plants was grown in both conventional glasshouses and in magenta ones. These plants included 20 varieties of tomatoes, cucumbers, lemons, limes, peppers, strawberries and basil. The researchers monitored both photosynthesis and fruit production. 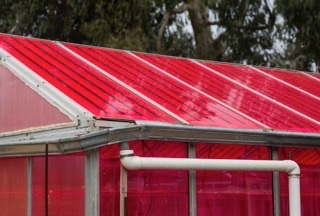 The result shows that around 80 percent of the plants weren't affected by the magenta light, and 20 percent actually grew better while tomato plants grown in the magenta glasshouses required 5 percent less water, reports New Atlas. “Reducing the energy consumed by greenhouses has become a priority as the global use of greenhouses for food production has increased six-fold over the past 20 years to more than 9 million acres today—roughly twice the size of New Jersey”, according to Loik.